In this June 5, 2015, file photo, U.S. Army Sgt. Major Jeffrey Lewis salutes the remains of U.S. Army Cpl. 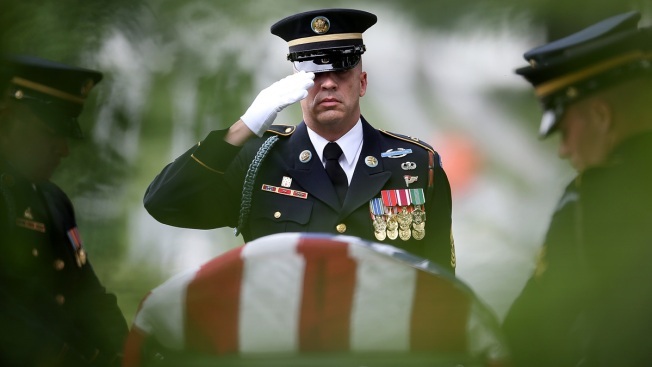 Richard L. Wing, whose remains were recently identified and returned to his family after 65 years following his death during the Korean War, during Wing's burial service in Arlington, Virginia. Wing, from Toledo, Ohio, was listed as missing in action in November of 1950, and was later reported by fellow prisoners of war to have died while being held captive. The American military command in South Korea is preparing for the North Koreans to turn over the remains of an unknown number of U.S. or allied service members who have been missing since the Korean War, U.S. officials said Tuesday. Officials say the timing of a ceremony is uncertain but could be very soon. The officials weren't authorized to discuss the preparations before an official announcement so spoke on condition of anonymity. The remains are believed to be some or all of the more than 200 that the North Koreans have had for some time. But the precise number and the identities — including whether they are U.S. or allied service members — won't be known until the remains are tested. President Donald Trump raised the likelihood of the repatriation of remains last week after his summit meeting with North Korean leader Kim Jong Un. At the time Trump said, "We're getting the remains, and nobody thought that was possible." The Defense Department, State Department and White House declined to discuss the latest development. The Pentagon would only say that an interagency effort is underway and that Trump's agreement with Kim last week cleared the way for the planning for the return of remains. The transfer of remains is usually done in a somber, formal ceremony, and that is what officials said is being planned. It also wasn't clear where the ceremony would take place, but it may be at the demilitarized zone on the border between North and South Korea. It's been more than a decade since North Korea turned over the remains of American troops missing from the Korean War. Richard Downes, executive director of the Coalition of Families of Korean & Cold War POW/MIAs, said he has since been told the North may have the remains of more than 200 American service members that were likely recovered from land during farming or construction and could be easily returned. But he said the vast majority have yet to be located and retrieved from various cemeteries and battlefields across the countryside. Between 1996 and 2005, joint U.S.-North Korea military search teams conducted 33 recovery operations and recovered 229 sets of American remains. Washington officially broke off the program because it claimed the safety of its searchers was not guaranteed, though the North's first nuclear test, in 2006, was likely a bigger reason.